Dillon Hall at the University of Windsor is a landmark building on the Windsor, Ontario campus. Founded in 1857 as Assumption College the school became the University of Windsor in 1963. Dillon Hall was designed by architect Albert Lothian and when built in 1927 Dillon Hall was known as the Assumption Building. 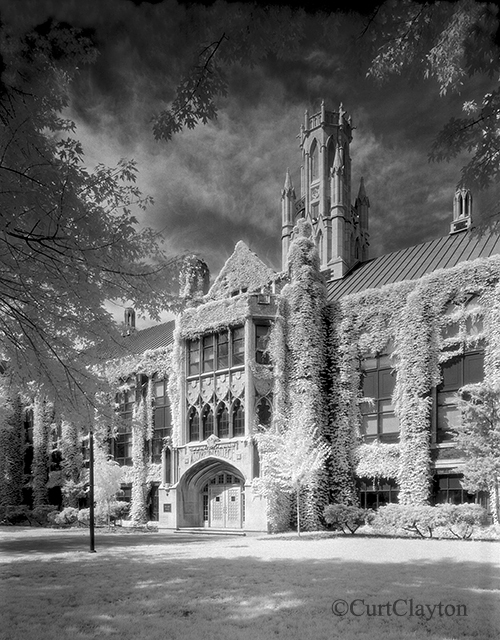 This photograph was shot on one of my favorite films, 4×5 Kodak High Speed Infrared. The glowing highlights produced by this film were caused by the lack of an anti-halation layer on the film. Kodak discontinued production of High Speed Infrared in 2007. There are a few companies producing Black & White infrared film today but none have the same look as Kodak High Speed Infrared. I’ve photographed Dillon Hall many times. In the mid 1980’s I photographed a Chrysler “K car” in front of Dillon Hall for the Chrysler new car catalog. This photograph is my personal favorite of Dillon Hall and was shot shortly before a restoration project that included removal of the ivy.